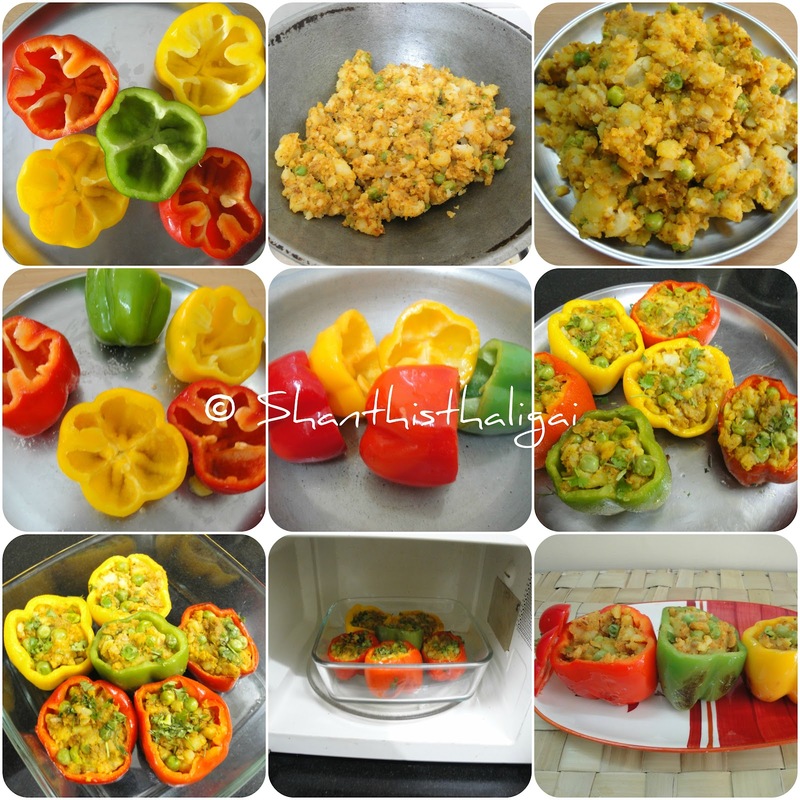 Stuffed bellpeppers / Bharwan shimla mirch is a unique, tasty side dish. I have stuffed the bell peppers with potato filling. The choice of filling can be made according to your interest and creativity and can be made with spiced up paneer, veggies, quinoa, rice, etc. and you can also top up with cheese if you bake. You can also bake, steam or deep fry in oil. The quantity of the filling depends upon the size of the capsicum. My bell peppers were medium in size. I toasted it on stovetop in a pan. The measurements given are for 6 medium-sized bell peppers. Boil, peel and cook potatoes, mash well. Heat oil in a pan, add cumin seeds, grated ginger, green chillies,(add onions now if using), peas and saute for a while. Add potatoes, salt and all other ingredients given for stuffing, mix well. Switch off the stove. Add coriander leaves, mix well and allow it to cool a bit. Meanwhile, wash the bellpeppers, pat it dry. Cut the top portion of the bellpeppers, de-seed, spread little salt inside and outside of the capsicum and rest it for 5 minutes. Grease the capsicum with melted butter, heat the pan and cook on all sides until you see white spots. Take out and when cool, stuff the potato mixture. Again brush bell peppers with melted butter, heat the pan, arrange the stuffed bellpeppers, and cook in a low flame. Turn it on all sides with a tong until the bellpeppers change the colour and have light brown spots on it. Be careful not to burn it. If using a microwave oven, cook in micro-high for 5 minutes. Turn in-between. I would like to have this crunchy. You can also cook until it shrinks. Serve hot with rotis or with rice as a side dish.